Our upgrade timing chain gear kits for the Nissan YD25’s, Navara and Pathfinder, we believe are the best available on the market. 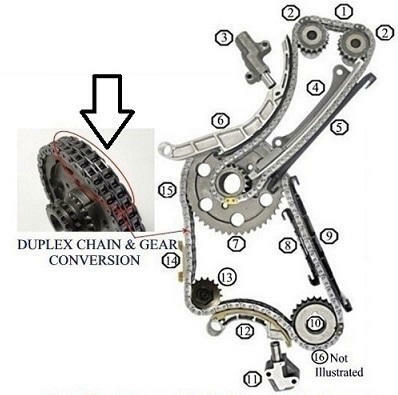 This timing chain kit upgrade converts your lower primary chain and gears to “Duplex” to match the “Duplex upper secondary chain and gears. Our timing gears are made from a solid one piece gear (billet), which greatly increases strength and longevity. Inferior bolt together gears do not compare to a solid one piece gear design. What also sets our timing kits apart from other suppliers is we include a “Duplex” vacuum pump conversion kit. This vacuum pump upgrade is a simple and easy installation. Our standard replacement timing chain kits for your Nissan YD25 are still made of high quality, including Genuine Tensioners, 4 x Gears, 2 x Tensioners, 2 x Timing Chains, Rails. 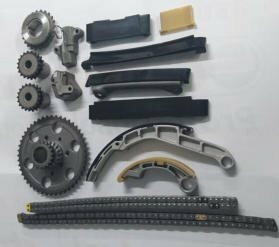 STANDARD TIMING CHAIN KIT Includes: Japanese single row primary & double row cam chains, does not include brake vacuum pump gear replacement which is supplied in our upgrade kits. Standard kits do not include Duplex double primary chain or vacuum pump upgrade. UMR Engines qualified technicians can supply & fit your timing chain kit, from standard to upgrade conversion kits. What ever your engine problem our experienced diesel mechanics can diagnose and professionally repair your diesel engine. Our workshop has vast experienced with all makes and models of Common rail and Non common rail light diesel engines. UMR Engines has been building engines since 1975, trusted by RACQ as an approved repairer UMR Engines has been servicing the automotive industry since 1975 and repairing local vehicles, We are located at Slacks Creek – Brisbane area, Call us now for an estimate on your repairs.